Two are entry inhibitors. As well as ibalizumab (Trogarzo), already reported here, the conference heard about fostemsavir. This drug, originally called BMS-663068, stops HIV from entering cells not by attaching to the CD4 receptor on cells, as ibalizumab does, or to the CCR5 co-receptor, as maraviroc does. Instead it attaches itself to the virus, specifically to the gp120 molecule, the ‘spikes’ on the surface of HIV that are the means of viral entry into the cell. In order for HIV to lock onto the CD4 receptor and fuse with the cell membrane, the gp120 protein unfolds into a three-part symmetrical structure (a trimer). This change is necessary for it to attach itself to the host CD4 receptor. Temsavir – which is what fostemsavir becomes in the body – lodges itself into the internal structure of gp120 at the moment of its splitting apart and prevents the process of viral attachment. Peter Ackerman of ViiV Healthcare, who are developing fostemsavir, presented 48-week results from the BRIGHTE study of fostemsavir in highly treatment-experienced people. All participants in the study were failing their current antiretroviral therapy (ART) and had viral loads over 400 copies/ml. BRIGHTE was split into two different cohorts according to whether there were any other functional antiretroviral drugs that could be used in an optimised background regimen (OBR) or not. If people had one or two functioning drugs in at least two classes of ARVs that could be used to construct an OBR, then they were briefly randomised – just for eight days – to continue on their failing regimen and receive either fostemsavir or a placebo. Those receiving the active drug were thus essentially receiving fostemsavir monotherapy. After eight days, everyone received open-label fostemsavir plus the best OBR that could be constructed. If people had no functional antiretroviral drugs left, then they were immediately put on open-label fostemsavir plus an OBR in what Ackerman said was “as much of a compassionate release programme as a drug trial.” Investigational drugs were allowed in the OBRs in this group; 15 people, for instance, were also taking ibalizumab. There were 371 people in BRIGHTE. Ninety-nine were in the no-drugs-left, immediate treatment cohort and of the remaining 272, 203 were randomised to receive fostemsavir in the initial eight-day period, and 69 placebo. This was a very treatment-experienced and in many cases very unwell group of people. Their average age was 49, just under a quarter were women and a similar proportion were African American. Their average viral load at baseline was 4.6 log copies/ml (40,000 copies/ml). Three-quarters of them had CD4 counts below the AIDS-defining limit of 200 cells/mm3. Thirty-five per cent in the randomised group and 54% in the immediate-treatment group had a CD4 count below 50 cells/mm3, and 26% and 40% respectively had CD4 counts below 20 cells/mm3. Given these life-threatening CD4 counts, it is not that surprising that 20 people died during the study, eight in the randomised group and 12 in the immediate-treatment group. Virtually all people had treatment experience with the NRTI, NNRTI and protease inhibitor drug classes. With integrase inhibitors, 75% of the randomised group and 95% of the immediate-treatment group had experience. Thirty-nine per cent in the randomised group and 69% in the immediate-treatment group had taken the fusion inhibitors T-20 or T-1249. Twenty-six per cent and 40% respectively had taken a CCR5 inhibitor like maraviroc. During the eight days of randomisation, people on fostemsavir experienced an 0.8 log copies/ml drop (about a 6.5-fold drop) in viral load compared with an 0.2 log drop in those on placebo. At week 48, in a strict analysis that defined any change in OBR as a regimen failure, a viral load below 40 copies/ml on their regimen was achieved by 54% of people in the randomised group and 38% of those in the immediate-treatment group. Black participants in the study did somewhat better, with 65% with a viral load below 40 copies/ml vs 50% of other people, as did women (61% below 40 copies/ml vs 51% men). People with a baseline viral load over 100,000 copies did worse (35% below 40 copies/ml at week 48) and people with very low CD4 counts at baseline were more likely to fail (36% viral load below 40 copies/ml at week 48). In a less strict analysis that allowed changes in the OBR, 62% in the randomised group had a viral load below 40 copies/ml and 48% in the immediate-treatment group. If viral load failure was defined more liberally as a viral load over 400 copies/ml, then 86% in the non-randomised group and 55% in the immediate-treatment group had a successful virologic response. People in the randomised group experienced an average increase of 139 cells/mm3 in their CD4 counts, from 100 cells/mm3 at baseline to 239 at week 48. The average increase in the immediate-treatment cohort was 64 cells/mm3, from 41 cells cells/mm3 at baseline to 105 at week 48. Safety, in this highly experienced and unwell population, was generally good, with the most common ones being nausea, diarrhoea and headache. But 33% in the randomised group and 44% in the immediate group had to discontinue their regimen at some point. Ackerman P et al. Week 48 safety and efficacy of the HIV-1 attachment inhibitor prodrug fostemsavir in heavily treatment-experienced participants (BRIGHTE study). 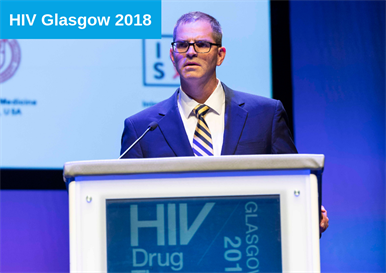 International Congress on Drug Therapy in HIV Infection (HIV Glasgow), Glasgow, 2018, abstract O344A.